When we finished the race, I felt like I could keep running for another few miles! 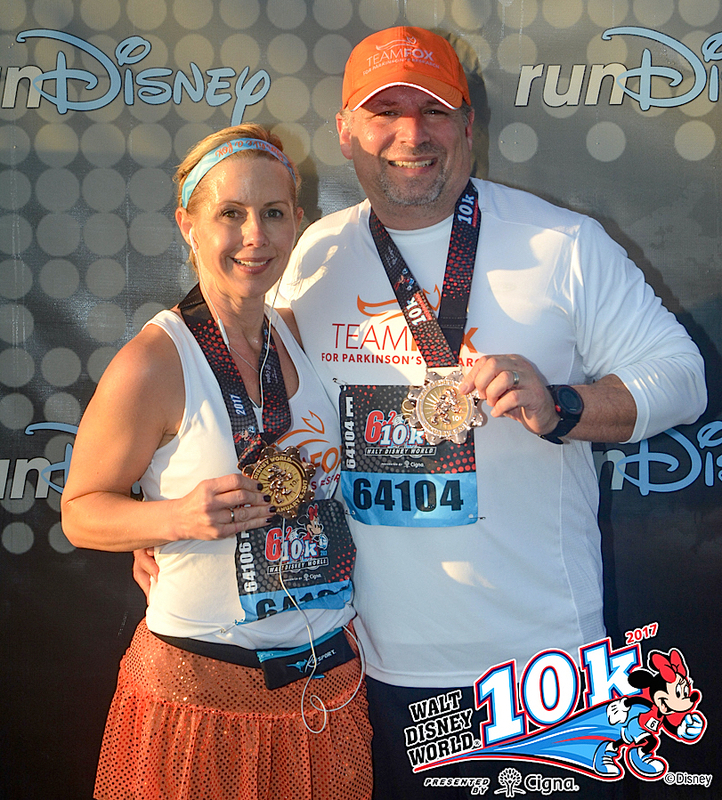 On January 6th, I completed the Walt Disney World Marathon Weekend 10km race. This is the longest distance I have run since my Parkinson’s diagnosis. As I write this, I’m still in disbelief that I actually completed a 10k and survived (well, for the most part). The post-race week was a little rough getting my meds back on schedule and regaining a normal sleep pattern – at least as normal as it can get for a Parkie. It was worth it all – here’s why. 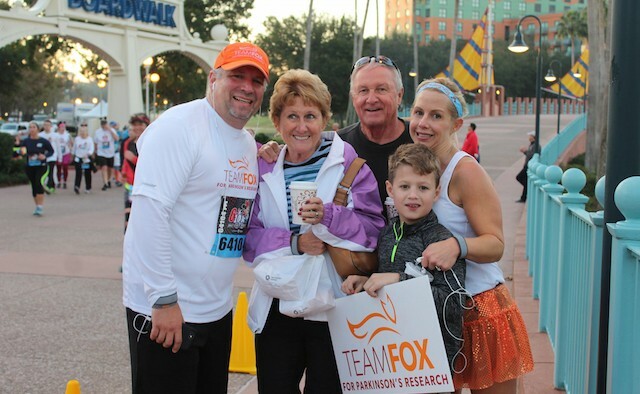 It was one year ago when we met a fantastic group of Team Fox athletes participating in the Disney Marathon weekend. My husband, who was not a runner at the time, became one of those runners. He successfully completed the 10k – his first race ever. I was so proud of him. As he trained for the race, I longed for the days when running was a regular part of my life, before Parkinson’s. I was a little envious that he could run, but I couldn’t. At least I thought I couldn’t. 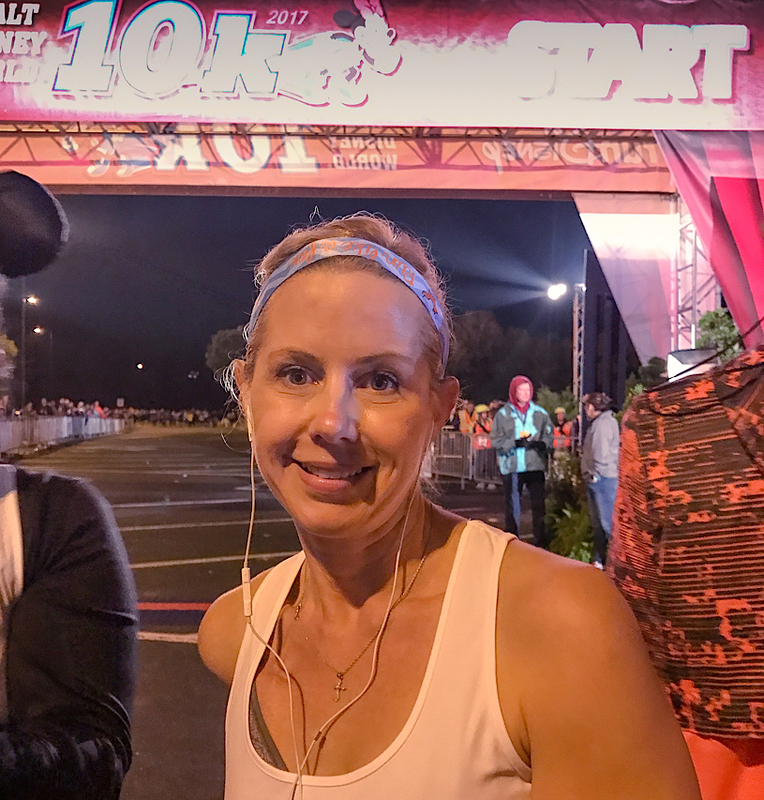 On that weekend a year ago, I watched as several runners with Parkinson’s complete races ranging from the 10k to the Dopey Challenge (Day 1: 5k; Day 2: 10k; Day 3: half marathon; Day 4: marathon). I thought why not me too? I committed to running the 10k in 2017. I felt confident that having one year to prepare would be sufficient. Over the last year I intermittently trained for the race. I kept procrastinating. It was too hot. I was too tired. Needless to say, I did not feel prepared to run a 10k, but I had made a commitment and so many people were supporting me emotionally and financially (through their generous Team Fox donations). I did not want to let them down. On race day, I woke up at 1:30am to prepare for the 5:30am race. I had to give my body time to wake up, my meds to be properly timed, and my mind to prepare. Two hours later I was on the Disney bus being transported to the start line. Smiling on the outside, but inside wondering if I could really do this. My amazing husband had a plan for us to succeed – a run/walk regimen. He is my rock and my strength. He knows when I’m capable of pushing my limits and when it’s time to take a moment of rest. Shortly after we got to the start line area, we met up with the other Team Fox runners. They are seasoned runners and they were SUPER excited to be there. Their enthusiasm was contagious. We laughed, goofed around and took pictures as we waited for the race to begin. Most of these people I had met over the last year, either in person or on social media. We all know each other, but bonded even more over the weekend. We all share a common goal – to outrun Parkinson’s. 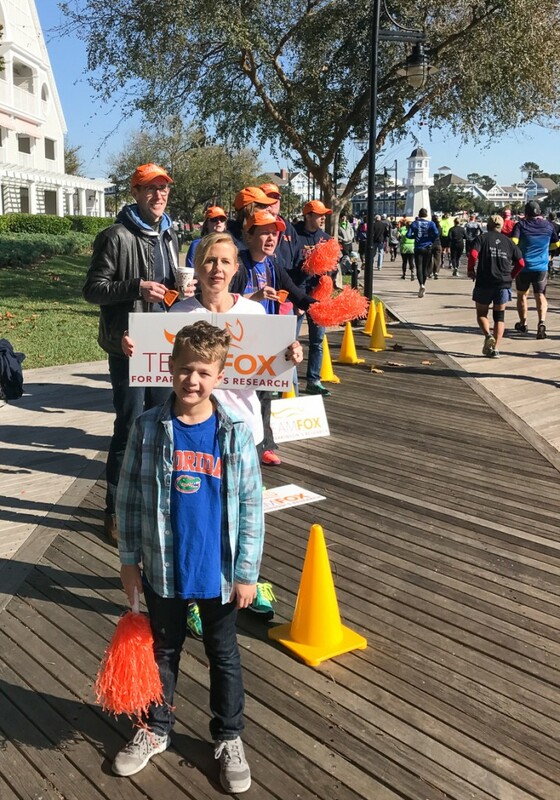 This year there were 90 Team Fox runners/walkers who participated in races ranging from the 5k to the Dopey Challenge. Eight members of the group have Parkinson’s. When we finished the race, I felt like I could keep running for another few miles! I was so excited that I immediately committed to the half marathon for 2018. I even got a little “dopey” and considered doing the Dopey Challenge but I think I’ll stick with the half marathon, unless my Team Fox family convinces me otherwise. Overall, it was a fantastic family weekend. My son and parents joined in the fun by cheering us on. We stayed the weekend to cheer on the marathoners too! Tonya Walker has been living with Parkinson’s disease since the age of 32 and had DBS surgery on her left side in 2013 and then on her right in 2015. She created ‘The Shoe Maven’ fashion blog in 2015, started up her own fashion label called TSM Originals in aid of The Michael J Fox Foundation. Tonya is a passionate advocate for increased awareness of young-onset Parkinson’s and loves shoes. She lives in Florida, US, with her husband and young son, where she is also a law professor.